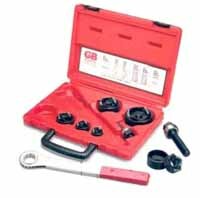 This GB Mechanical Slug-Out Set has a four point design that allows the slug to drop automatically without splitting. It also punches up to 12-gauge stainless steel and up to 10-gauge mild steel. The set includes a ratchet wrench, all 6 common conduit pipe sizes of punches and dies, and two drives, in a rugged storage case.